We really enjoyed the resort with all its amenities. Grocery store was just around the corner. Pool was great, hot tubs were wonderful. We had such a good time staying here. It has a beautiful pool with slides and hot tubs. It’s in a great location. It was clean and had everything you need. We would come back. Property description was accurate, pool and surrounding area excellent, goo customer service; restaurant on site nicely located next to beach with sunset view and excellent food. We have stayed at Waipouli resort since it opened. We love this resort and it’s location. The condos are so well layed out and the resort and it’s grounds are gorgeous. Love the app Rental Host that gives you real time access to folks that can answer questions provide help or support. They were very helpful. Great experience. Ground floor was nice for easy access to pool and yard for kids to run around. Would do it all again minus the rain! Complex appears to be best on the island. Unit was clean and as described. Has everything you need. Communication and arrival instructions were perfect. Could use upgraded TV at least in Living Room. They are not expensive and more and more people are usuing SMART TV’s with some kind of membership such as Netflix. Waipouli Resort is lovely, is centrally located on Kauai, the pool area is great and having the restaurant Oasis on the Sea is a plus. Unit F104 is clean, comfortable and well maintained. We enjoyed breakfast on the lanai and often had drinks there in the evening. We had a truly fine stay. 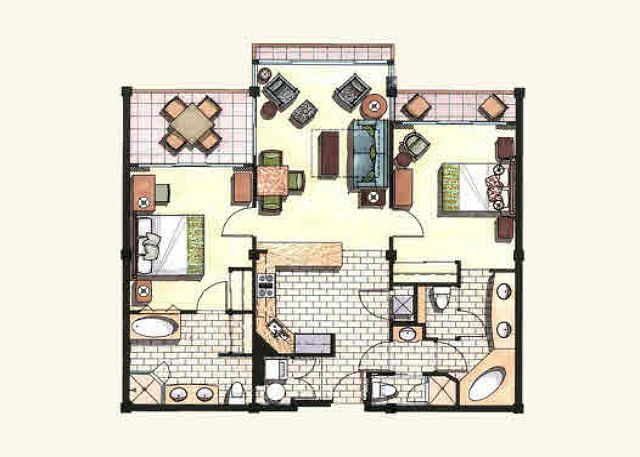 Convenient location to explore the island, clean and spacious apartment. Everything here exceeded our expectations! Beautiful grounds and great amenities! Not sure if there's a better room on the property. Opens right to a private little lawn for the kids to play and have breakfast. Few steps from pool and fitness room. Beautiful interior with comfortable beds. Tons of delicious restaurants within walking distance. Tons of activities and hikes near the river. We'll be back soon!! A very nice resort which the grandkids loved, especially the pool and lazy river. Rooms were great and we had great service when we encountered a broken vcr and a leaking pipe under the sink. The maintenance person Mel?? Was great and fixed everything. Super guy. 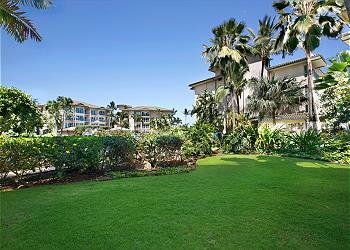 We loved the location with the grassy area, pool, and easy access to the beach. The unit was also very comfortable and very attractively decorated. The layout was perfect. If I had to make a suggestion (twist my arm) I would recommend spraying for cockroaches more than once a quarter since this is a first floor unit. But it wasn't horrible. The only other touch would be to leave the guest some bottled water or something to make them feel welcomed. Otherwise it becomes the equivalent of a hotel room without the amenities. 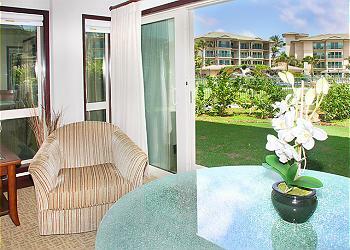 We are so glad we chose Waipouli Beach Resort. It is a clean, beautiful place in a great location. We will be staying here again. F104 opens up to a yard area it shares with just one other condo, no one was in the condo next to us so the boys had the whole yard to themselves. You will be steps away from the lazy river entrance. 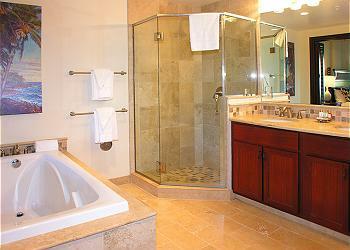 We really were just so impressed with the cleanliness and and location of this property. It is spacious, there were beach toys and chairs available and other items I didn't expect, it has a well stocked kitchen, then top it of with a full size washer and dryer! It was perfect for our family! One of our favorite places we've ever stayed! This location, set-up, and property was an absolute gem! Our family loved the central location of the resort, the ideal location of the room, as well as the over-all experience of the property - staff, food, etc. We had everything on hand we needed - cooler for the beach, chairs for the lawn, and just enough privacy. Our family, daughter and son in law, granddaughter, and another daughter stayed at Waipouli for eleven nights. We explored all parts of the island and found the location to be ideal. The accommodation was very comfortable and overall well equipped. We absolutely loved our condo F104, 3 adults and 3 children were very comfortable. The condo had everything we needed and the facility as a whole was beautiful, perfectly maintained and the staff was awesome. Once you get there you won't want to leave. Such a beautiful resort! Great place to stay while touring the island but also with in walking distant of shops, restaurants and bars. The rental was lovely and close to pool, fitness center and beach! Great restaurant on the beach and the cycling trail along the beach was so easy to get to. We were very sorry to leave! 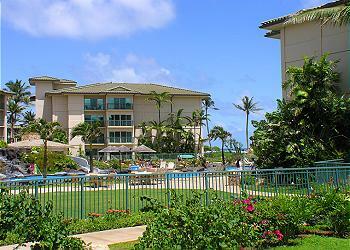 This is the second time we have stayed at Waipouli Beach Resort, and the first time in F104. We prefer the ground floor so that our young children can walk outside safely and play in the grass whenever they please. The kitchen amenities in this unit were not quite as nice as the last unit we stayed in, but still very good. We had an issue with the coffee maker (twice) and Kauai Exclusive was very responsive (twice), and made sure it was taken care of. The kitchen floors weren't quite as clean as I would have liked, but I really only noticed because my 9-month old was crawling everywhere and mopping the floor with her pants. This property puts you five minutes from Lydgate Beach Park, which is where we spent most of our days, and five minutes from Kapaa town. 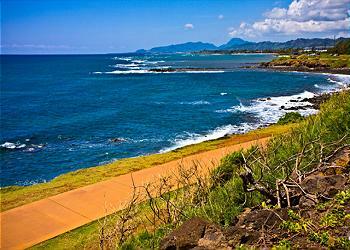 It's also an easy drive north our south for day trips to other sites (lighthouse) and beaches (Poipu, Anini). We will definitely be back, and we will definitely stay in F104 again. I highly recommend this property, especially to families with young children. This is a great property. 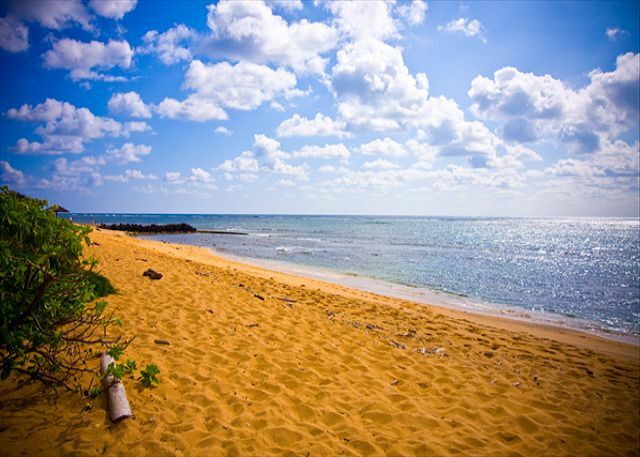 The location is very convenient to access any part of the island, and the airport. We loved the enclosed patio grass area, and easy access to the pool/beach. The rooms were clean, nice, and very roomy. Having 2 full bathrooms and laundry facility was fantastic. We will stay there again. The condo is updated, clean, close to beach, pool, and shopping! We were very impressed with the quality of furniture and amenities included. We have stayed in this unit multiple times and love it. It is a ground floor with a big private front yard which was great for our small grandchildren. 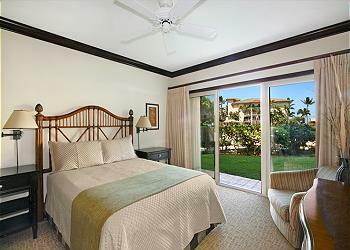 The beds are very comfortable and the layout is very conducive for two families. The Kauai Exclusive team was great! 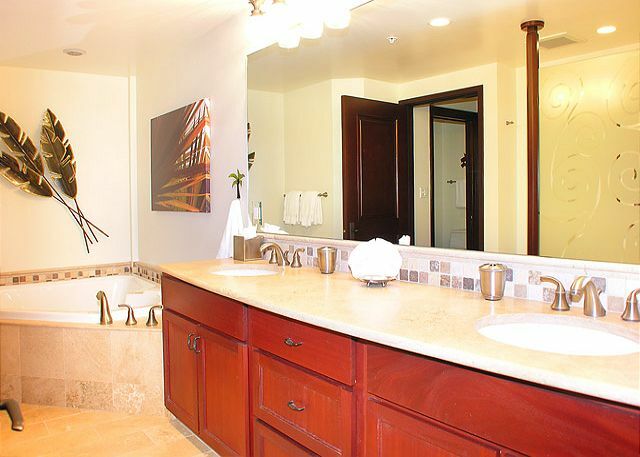 The condo is superb, it has wonderful bathrooms, kitchen and bedrooms. It felt like home for 10 days, we are even considering buying a condo. If you know the island, it is a great location. Close to grocery stores, but most importantly half way between the north and south shore. If its raining in Princeville, you can just turn left out of the parking lot and go to Piopu. The only drawback for our vacation, is that the weather didn't cooperate at times and the pools' heater wasn't working. However, I do think that normally the pool is heated. The pool is fun, kids and adults will both enjoy it!! Excellent resort, great for kids, pool super. Will go back again. Try to get a condo with a pool or ocean view. Stayed in F104. The resort was beautiful and well maintained. The unit was everything it was advertised to be. Everything was clean and well kept. We would go back and stay here again. The arrive at waipouli late at night and the directions we received from the property manager made it really easy to find. We open the unit and everything was working properly and as described in the listing and photos. The location in the resort was very convenient right in front of the pool, grills and gym just walk thru your private yard and you are there. We really enjoyed the private yard to run around with the kids. Amenities were great, we were six and felt that we were not missing anything. Kids enjoyed the slides later in the day and we explored all the beaches near by and in the north shore. The location was central to go south or north. Grocery store across the street was great as well. The manager was great and prompt to answer our questions or requests and the booking process was very easy. We would definetely recommend this unit to friends and family and will definetely use it again. Unit F104 at Waipouli was a wonderful condo. Beautiful location and very well equipped. The beds were so comfortable and the bedding and towels were new and luxurious. F104 was simply amazing. The resort was amazing. Everything was as depicted. My family never had any issues with the room itself or the resort. The pool area was perfect for kids and adults and everyone in between! The river, slides, waterfall, 3 spas, Oasis restaurant/ lounge, all amazing. My son was able to feed the beautiful fish. 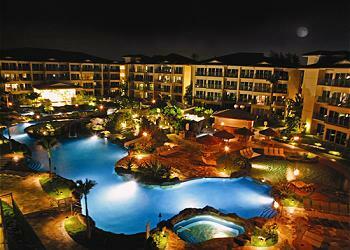 The resort is luxury all the way, and as for F104, I don't know how to describe how amazing it was. It was WONDERFUL! 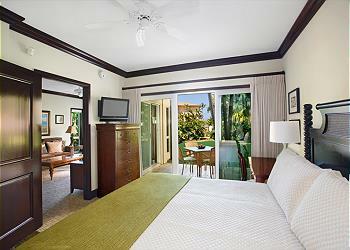 Room was just as described, perfect for our family of 6 with all the modern amenities. Resort was beautifully landscaped with an incredible pool. 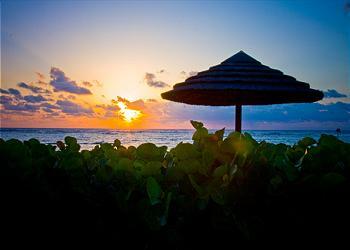 Nice Beach for sunrises and relaxing. Atmosphere was family friendly, very quiet in mornings/evenings. Concierge was a great resource for activities. Management was quick to help us with a few minor issues. Location was convenient to everything. We loved it! We thoroughly enjoyed our stay at this condo. Enjoyed the ground floor location close to the pool but was still very quiet. The condo was lovely. 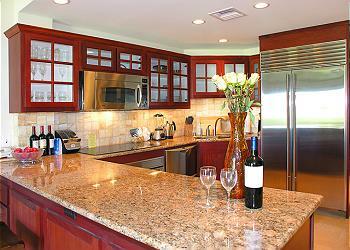 The kitchen was well equipped and allowed us to host a dinner party for our friends. Would definitely stay here again. We would use Kauai Exclusive again as well. They were very responsive to any requests. Mahalo! The resort and condo were absolutely amazing! The beds were comfy and the rooms were quiet. The only issue we had was that the information sent to us stated that we must be out by 10:00 am on the day of departure but we could use the resort for the full day by calling and obtaining a code. When I called for the code, I was told that was not offered. They did finally come through and allow us to stay until our flight time. It was easy booking, checking in, and checking out of this resort. The staff is very helpful and accommodated our needs. The property is beautiful and is on the beach with a great pool. It is right across from grocery store, restaurants, and shops. Highly recommend. F104 was clean,comfortable and the location was very convenient, easy access to the pool. The beds were comfortable, and did I mention clean? Overall a great condo, will definitely rent here again. I would also like to mention that the management company was great to deal with, especially Sonja, our exclusive concierge. She was very helpful and accommodating. 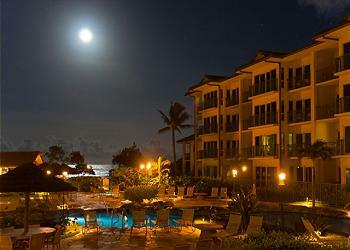 We thoroughly enjoyed our stay at Waipouli Beach Resort. Unit F104 is a luxurious condo with every possible amenity. It was well stocked as well which was appreciated. The location on the ground floor was great - we had our own private 'yard' directly in front with quick access to the pools and hot tubs. The pools and grounds were immaculate and the staff very friendly. 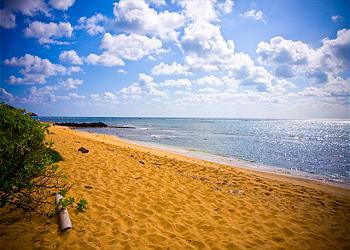 We would highly recommend Waipouli Beach Resort AND Kauai Exclusive Management. Patrick was wonderful to deal with. We will be back!! A weight scale and hairdryers are not able to use. We are all very happy to choose your Resort for our family gathering, specially with Joshua's OMOTENASHI. All enjoyed to play in the real nature!! Hope to come back someday!! Thank you Joshua! tor your hospitality and we are really glad to see your parents after long time and your beautiful family. See you sometime in Japan!! Very happy with the resort. Wonderful locations, amazing property. Property Management company was great to deal with, we had a problem with the air conditioner and had someone fixing the problem within 30 minutes. Unit was very clean. Will stay there again. The only thing I did not enjoy was the early yard work. It is great that they have workers that maintain the yard and property. However being woken up at 7 am because of leaf blowers outside our lanai doors not the best. Other than that everything else was great. My wife and I could not have been anymore pleased with our experience renting from Kauai Exclusive Management. They made the experience as enjoyable as possible and were responsive to any questions that we had. They went out of their way to arrange a late check out for us, even going as far as opening another rental for us to use until we left for the airport. I have to thank Josh for his understanding in dealing with this experience. I'm not sure anyone else in the rental business would have done what they did for my wife and I. All my thanks and admiration for the job that they did. Very nice place, ready to return. My wife and I stayed at this wonderful resort to celebrate our 25th wedding anniversary. We traveled with my wife's brother and his wife who were celebrating their 30th anniversary (on the same day!). The resort lived up to every one of my expectations. The pool area is fantastic, and the beach is a great place to relax, walk, or watch the sun rise. Our specific unit was all that I had hoped for. It was spacious, luxurious, and clean, and we really enjoyed having a small, secluded yard and quick, ground-level access to the pool area through the back doors. Working with Kauai Exclusive Management was awesome. They were very professional, friendly, and made the whole process as easy as can be. I hope we are lucky enough to stay there again someday. Mahalo! Waipoui is a wonderful vacation experience for the whole family. We were there with our daughter and two grandkids and everyone had a great time. The pool with the two waterslides was a great hit with our 5 year old grandson. The beach directly behind the Waipouli has a good tide pool for exploring and wading in, or just sitting on the beach and watching the sunrise. Our condo was very clean, beds were comfy, and it was quiet at night. We had dinner at the Oasis one evening and the food was very good. This is our second stay at the Waipouli and we would definitely consider another stay there! This was a fantastic place for our vacation. Our daughter just loved everything. The pool was close, the ground floor was perfect for her to run. She loved the watersides. Very nice and clean rooms. Will definitely be back. Loved it. Loved the unit - had everything you needed and lots of extras. We loved the 3 hot tubs, the beautiful pool and location. It was conveniently located next to the Safeway, Foodland and Longs Drugs. There were many restaurants within walking distance. Rooms were beautiful and bathrooms to die for. We loved this place. Nicest condo I've ever seen. Ground floor location is very convenient. Facing swimming pool with no real ocean view, but that didn't matter to us being on the East side of Kauai: Not going to see any sunsets there and there was no appreciable increase in cooling trade winds there. Since this property was managed by Kauai Exclusive Mgmt, we were given to understand that the in house concierge was off limits to us. We were advised to contact Kauai Exclusive Mgmt about booking tours, which I did. I never received a call back. Other than that, my dealings with the management were exactly what you'd want: good directions to the resort and room, correct key codes for room and pool, quick to set up the reservation. I would advise the traveler to know the areas of Kauai in advance. In this part of the island the waters are a bit rough. The pool was fantastic for kids. 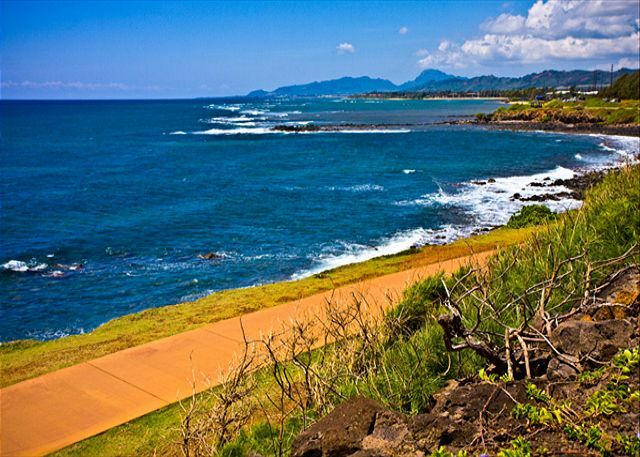 Waipouli Beach Resort was/is the perfect place for a vacation in Kauai. Close to shops, easy to find, WONDERFUL pool and water features, BBQs and right on the beach. You would be hard pressed to find a better situation - especially for families or groups. Thank you. Made the wedding perfect. Perfect place for a family vacation. Bottom floor made it easy to come to and from room from pool and when BBQ'ing. Room was beautiful as well as the grounds. Not one complaint. Great vacation! 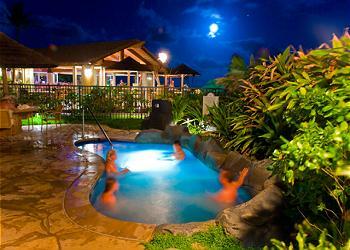 My grand daughter spent most of her time in the pool so the Waipouli with it's water slides was the best resort for us. We had a great time. The Place was really nice, perfect for what we wanted. The oasis on the beach had great food, and great people running it. Wich really mad the place a great place to stay. Over all I would stay there again. we stayed in several condos on the property. all were very nice as was the whole resort. 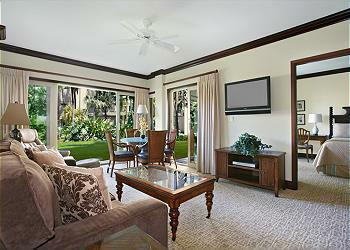 Kauai Exclusive was very helpful and accommodating didn't just drop us once we had rented the property. Dishwasher needs repairing, it would also have been nice to have basic cleaning supplies in the house such as windex or stainless steel cleaner. The house started to show it's wear towards the end of our week stay, even by my cleaning with what was provided. We have a new dishwasher in the room and we are considering cleaning supplies that are organic and non toxic to our guests with children. We do recommend the mid stay cleaning @ $100 for one week stays though the mid stay is only mandatory if you stay 10 nights. We are generally able to connect with the guests to check in and it seems that these folks were out and about every time we called. 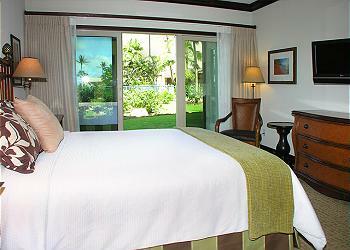 We are available 24/7 for our guests at 1-877-Go-Kauai as we are happy to deliver any necessary items to the room. 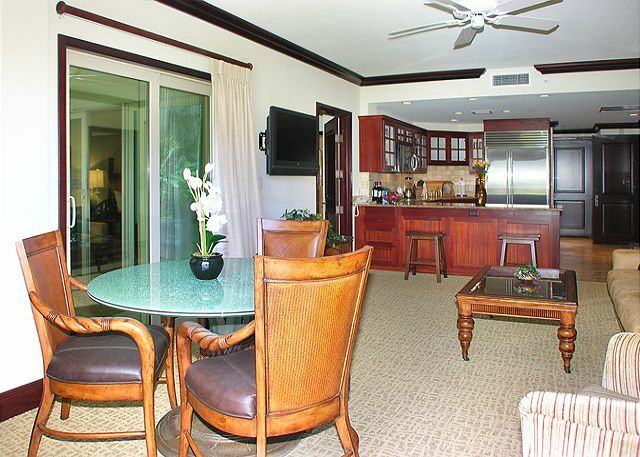 we loved the beautiful unit, pool and BBQ&quot;s.
Great central Kauai location and spacious condo with luxury amenities. When contacted the management company was very helpful. Wow! What a fantastic vacation our family had at F104! The location was the best and we will be returning to the same condo next year hopefully (right next to the pool gate, bbqs, and with a great yard for the kids to run around in). The condo was very comfortable, the location was perfect, and the customer service was great! Our family had a great vacation exploring Kauai and coming home to an amazing resort and perfect home away from home! close to the pool also made it nice. Josh, the property mngr, was great bringing us a set of new knives when we mentioned to him that the ones in the unit were dull. We've already recommended this unit to our friends! Our family was very happy with our accomidations. The room was beautiful and clean and modern. The pool was amazing! Even when we went out exploring the island and visiting the gorgeous beaches, our kids couldn't wait to get back for a swim in the pool. The water slides were fun for us big kids too! We can't wait to get back to Kauai! Rented five condos over Christmas and were extremely happy with all of them. Can't say enough about how helpful Josh at Kauai Exclusive was. Beautiful development, great pool for all ages from 3 to 72, nice beach, and the Oasis bar/rest. was excellent. Great location for families with the two supermarkets across the street, did a lot of cooking in the well equipped kitchens. 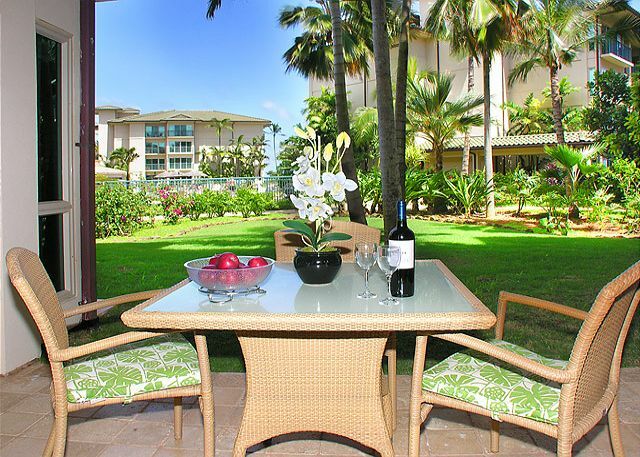 This is the third time I have rented a condo in Hawaii, first on Kauai so I do have something to compare. This was the best. Patrick (manager) was extremely helpful. I will definitely recommend to everyone I speak of my vacation to this island. I hope to be back soon. I first want to thank Josh at Kauai Exclusive Management for helping us with any changes and requests that were solved promptly and successfully. It made everything go smoothly. The location of the resort was well centralized to get to either side of the island when needed as well as walking distance to grocery, pharmacy, restaurants, etc. The unit itself was beautiful and immaculate. No signs of distress on the walls or furniture and the appliances worked perfect. Plenty of dinnerware and cooking utensils. The walkout to the grass was nice for kids and gate to the pool was within 40ft which was also where the BBQ was, perfect. No, it wasn't beachfront but the 90 second walk to the beach to see sunrises sufficed (note sarcasm). The unit gets some early morning sun with shade in the afternoon. The grounds were well maintained, we always saw people cleaning and/or manicuring the property, even cleaning the BBQ. The saline pool was great for the kids, no burning eyes from chlorine and the 3 hotubs with sand bottom were awesome. Parking never seemed to be an issue either. The only 2 negatives i have are that the snack shop at the pool was not always open and when it was it too expensive, but all the resorts are like that. The Oasis restaurant was never open, not sure if it was seasonal or being renovated but there was work going on inside. All said, we would recommend this place, everything you see is what it looks like when you arrive.